Benny Glaser experienced a horrible run at the World Series of Poker last year, the first time he’d come and played in the annual Las Vegas classic. He entered several events and didn’t cash – not even once. 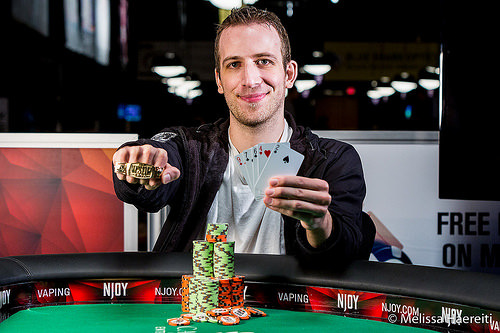 Unfazed by the disappointment, this year is quite a bit better now, as Glaser has accomplished what less than .1 percent of all poker players who enter events manage to do, by winning a coveted WSOP gold bracelet. Even more satisfying, Glaser won an event loaded with talent and proved that he belongs in the discussion of serious contenders, especially in lowball-related games. Glaser, from Southampton, UK prevailed in the $1,500 buy-in Deuce-to-Seven Triple-Draw Lowball event, which drew 388 players. The prize pool amounted to $523,800, with Glaser taking $136,215 from the pot for first place. He also collected his first WSOP gold bracelet. Glaser overcame several disadvantages, particularly at the final table. Most impressive, he overcame a 4 to 1 chip disadvantage held by three-time gold bracelet winner Brock Parker. When the duel began, it appears Parker would swat away his final challenger with ease. But a blistering run of cards ruined Parker’s hopes, and gave the British poker player and part-time writer what was admittedly a victory that was just as much a relief as a joy. Meanwhile, runner up Brock Parker missed the chance to join a special category alongside some of his widely-respected peers who have garnered additional titles at this year’s series. Among those who are multi-gold bracelet winners adding to their jewelry collection have been Robert Mizrachi, Max Pescatori, John Gale, Phil Hellmuth, Tuan Le, Keith Lehr, Daniel Alaei, Brian Hastings, Phil Galfond, and Jeff Madsen. However, Parker will have to win another event to join this crew. His payout amounted to $84,132. This marked Glaser’s second time to cash, both this year. He finished 289th in the Millionaire Maker tourney. Second Place: Brock Parker, from Silver Spring, MD came up short in his bid for a fourth gold bracelet. He now has 40 career cashes and more than $2.2 million in earnings at the series, with the $84,132 consolation prize added to his figures. 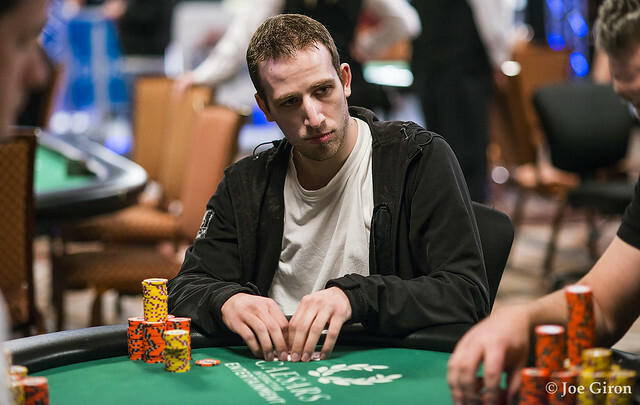 Third Place: Noah Bronstein, a 28-year-old poker pro from Bellevue, WA came in third place. He took third in an event last year and cashed for the 22nd time at the WSOP. Bronstein’s share of the prize money came to $54,092. 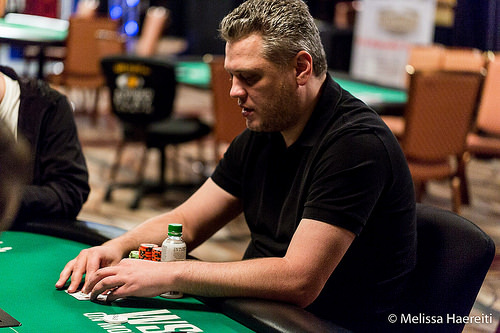 Fourth Place: Sergey Rybachenko, from Moscow, Russia finished in 4th place. He now has 18 cashes and 5 final table appearances on his resume. Fifth Place: Andrew Brown, a 33-year-old poker pro from New York City, ended up as the 5th-place finisher. He won a gold bracelet in 2008 and now has 8 WSOP cashes. 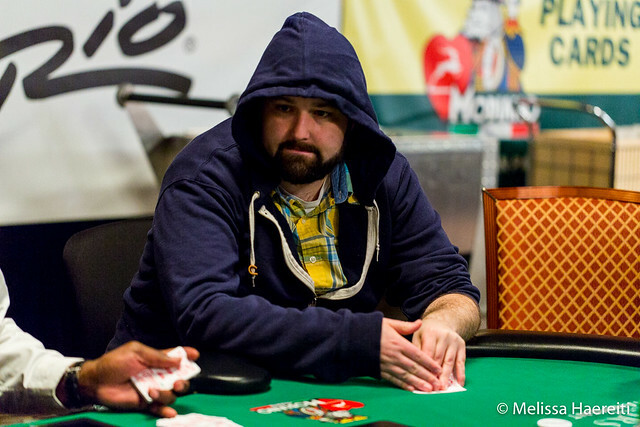 Sixth Place: Jon Turner, a 33-year-old poker pro originally from Myrtle Beach, SC and now residing in Henderson, NV came in 6th. This was the 36th career in-the-money finish for Turner, who came in 5th in the $10K Deuce-to-Seven Championship played days earlier. Turner now has in excess of $900,000 in WSOP earnings, but is still yearning for his first gold bracelet victory. 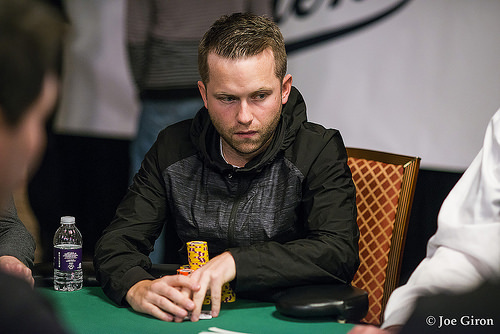 Seventh Place: Toby Mulloy cashed for the first time ever in a WSOP event by finishing in 7th place. He’s the manager of an Acura (car) dealership in Belmont, MA. Mulloy began playing poker online. He’s married and says he has a child on the way. Eighth Place: Steve Billirakis, the 29-year-old poker player from Chicago was hoping to win what would have been a third gold bracelet. However, the player who was once the youngest WSOP of all time (at 21) couldn’t gather chips once he reached the final table. This marked the 26th occasion that Billirakis has cashed at the series, which moves him up to about $1.8 million in career earnings. 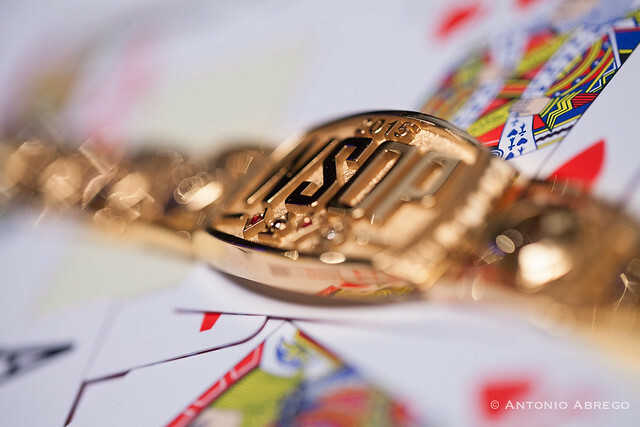 Aside from the final table finishers, other notable gold bracelet winning players who cashed included – Phillip Hui (10th), Dutch Boyd (11th), Tommy Hang (18th), Greg Raymer (21st), Brain Rast (23rd), Michael Mizrachi (28th), Randy Ohel (31st), Brian Yoon (38th), Vanessa Selbst (39th), David “Bakes” Baker (41st), and Allen Cunningham (42nd). There were 376 males and 12 females who entered this event (3.1 percent). The average age of participants was 38.7 years. Benny Glaser Wins His First Gold Bracelet in Event #33! Brock Parker opens the button to 80,000, and Benny Glaser considers carefully. He eventually calls, eying up Parker's short stack as he does. Glaser draws three cards, and Parker draws two. When Parker bets, Glaser check-raises to 80,000, and Parker three-bets all in for 120,000 total. Glaser calls to put Parker at risk of elimination. He's pat the rest of the way. Parker draws another single on the second round, but he returns it for one last try on the final round. With the action complete, Glaser tables the hand to beat: . Parker shows his four-card , drawing live for the double up. But he won't get it. His last card is another , and a pair of eights is no good. Brock Parker can't quite get his hands on his fourth gold bracelet, denied by his final opponent. He earns a consolation prize worth $84,132 for his runner-up finish. The title goes to Benny Glaser today. The Brit earned his first career WSOP cash just two weeks ago, finishing 289th in the Millionaire Maker. He's done a bit better this time around, collecting all the chips, his first gold bracelet, and $136,215. Benny Glaser opens the button to 80,000, and Brock Parker defends his big blind. Parker draws two cards and checks. Glaser draws one and bets 40,000, and Parker calls. The latter is still drawing two cards, and Glaser pats and bets again. Parker check-calls 80,000, and he still needs a productive draw. He misses, though. Glaser pats and bets, and Parker folds. Glaser is on the very verge of the title, just a couple bets away from having all the chips in play. Benny Glaser raises on the button and Brock Parker defends his big blind. Parker takes three and Glaser two. Parker check-calls a Glaser bet and takes one as does Glaser. Parker check-calls for a second time. The last draw arrives and Parker takes one with Glaser patting. Glaser bets after a Parker check and takes it down. Brock Parker opens the button to 80,000, and Benny Glaser three-bets to 120,000 from the big blind. Parker calls. Glaser draws one and bets 40,000; Parker draws three and calls. Glaser draws another single card on the next round, and Parker improves to a two-draw. He calls another bet, 80,000 this time. Both players draw one card on the last round, and they're content to check it down. Glaser shows , and his ace-low is good enough to win the pot and put him back on top of his opponent. Brock Parker raises from the button and Benny Glaser calls. Parker takes two and bets following a Glaser check. Glaser calls and takes one more on the second draw. Parker pats and bets again after a Glaser check. The third draw comes and they both pat. Glaser checks again and calls a Parker bet. Parker shows to win the pot. Brock Parker opens the button to 80,000, and Benny Glaser defends his big blind. Glaser draws two and bets 40,000; Parker three and a call. Glaser improves to a one-draw for the second round, and he bets 80,000. After drawing two cards, Parker folds. On the first hand of heads-up play, Benny Glaser opens the button to 80,000. Brock Parker defends his big blind, and he draws three cards. Glaser draws one and bets 40,000. Parker check-calls, and he improves to a two-draw. Glaser is pat now, and he bets 80,000. Parker check-calls again, and he's down to a one-draw for the last round. The action goes check-check. Glaser tables , and his ninety-eight wins the pot and moves him back into a slight chip lead. Two hands later, Noah Bronstein is all in from the button and gets a call from Benny Glaser in the big blind. Glaser discards all five cards and Bronstein takes two. Glaser goes three the second time around and Bronstein pats. Glaser only takes on the third draw and Bronstein pats for his tournament life. Bronstein shows and needs to dodge the outs of Glaser's draw. Glaser flips a to win the pot and eliminate Bronstein. Noah Bronstein three-bets Brock Parker from the big blind and Parker four-bets on the button with Bronstein calling. They both take one card and Bronstein check-calls a Parker bets. They draw one again and Bronstein check-calls with 30,000 behind. On the third draw, Bronstein checks dark and draws one against Parker's pat. Parker bets and Bronstein folds saying he paired up. Parker shows . Parker draws one card, and Glaser draws three. Parker leads out for 40,000, and Glaser calls. Parker draws the same single card again, while Glaser improves to a two-draw and calls a big bet of 80,000. Parker still needs one more card, but Glaser is standing pat. Parker leads back out for the last 80,000, and Glaser calls. Parker tables , winning the pot with Number Two. That pot puts Parker in a dead heat for the lead, a position which he'll go on to secure over the next three hands. First, Parker raises the small blind, and Glaser folds his big. On the next hand, Parker opens the button and gets two folds. To close out a quick and successful orbit, Parker gets a walk in the big blind, and he's now trying to open up a little gap on the other two gentlemen. Brock Parker raises from the button and gets a call from Noah Bronstein in the big blind. Both players take two and Bronstein check-calls a Parker bet. The second draw sees Bronstein take two and Parker draw one. Again, Bornstein check-calls. Bronstein takes one and Parker pats on the final draw. Bronstein bets and Parker goes back in his chair. He thinks for a minute before folding. Benny Glaser opens the button to 60,000, and Noah Bronstein three-bets to 90,000 in the small blind. In the big, Brock Parker cold four-bets to 120,000. Glaser tanks and folds, while Bronstein drops the extra bet into the pot. Bronstein draws two cards and checks; Parker one and a bet of 30,000. Bronstein calls, and he improves to a one-draw. Parker pats and bets, and Bronstein check-calls the 60,000. Bronstein draws one last card but check-folds to the last Parker bet. Benny Glaser opens the button to 60,000, and Brock Parker defends his big blind. Parker draws one card and Glaser two. Glaser makes the first bet of 30,000, but Parker check-raises to 60,000. Glaser makes it 90,000, and Parker comes right back with a four-bet to 120,000 total. Glaser calls. Both players pat the second draw, and Parker check-calls a bet of 60,000. He breaks his hand and draws a card on the last round, then folds to one last bet from Glaser. After surviving an all in on the previous hand, Sergey Rybachenko is all in for his last 45,000 against Brock Parker who raised from the button. They take two on the first draw. Rybachenko takes one and Parker takes two the second time around. Rybachenko takes one and Parker pats showing . Rybachenko shows and is drawing dead. The action gets capped predraw between Sergey Rybachenko on the button and Brock Parker in the big blind. Parker bets after drawing one and Rybachenko calls after taking one himself. The same actions get repeated for the second draw. Parker pats on the third draw and Rybachenko takes one more. Parker bets again and Rybachenko calls 60,000 of his remaining 75,000. Parker turns over and that is enough to take the pot. Rybachenko is left with less than a big blind. Parker moves to 1,200,000. Noah Bronstein raises to 60,000 from the button, and Benny Glaser calls in the small blind. Both players draw two cards, and action goes check-check. They draw two apiece again, and Glaser checks for the second time. When Bronstein bets 60,000 though, Glaser check-raises to 120,000. Bronstein calls. He draws one more card, while Glaser is pat. It goes check-check. Glaser fans , and Bronstein mucks. Under the gun, Noah Bronstein opens to 60,000. Benny Glaser three-bets to 90,000 from the small blind, and Bronstein four-bets to 120,000. Glaser calls. Both players draw one card, and Glaser check-calls a bet of 30,000. Neither player improves, so they both draw one more, and the action goes check-check. Glaser is pat for the last round, and Bronstein draws one more card. When Glaser checks, Bronstein squeezes his card and pounds his fist on the table for a check-back. Glaser tables , and his jack-low is good. "I started with a pair, and I paired every time," Bronstein tells his friends on the rail.